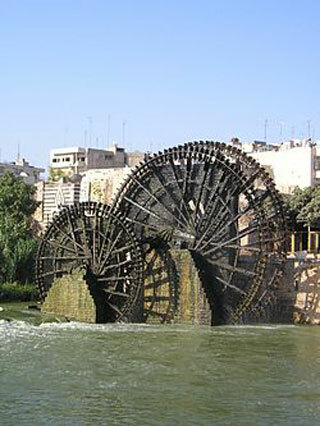 The Norias of Hama are a number of norias ("wheels of pots") along the Orontes River in the city of Hama, Syria. Only seventeen of the original norias remain. They are mostly unused now and serve an aesthetic purpose. They were called "the most splendid norias ever constructed". The earliest evidence for norias in Hama suggests they were developed during the Byzantine era, although none of the norias in Hama today precede the Ayyubid period. However, a mosaic found at Apamea dating to 469 AD pictures a noria very similar to those at Hama, suggesting they may have earlier origins. This article uses material from the Wikipedia article "Norias of Hama", which is released under the Creative Commons Attribution-Share-Alike 3.0 License.